Driven by a high demand for its scales, meat, and blood, the peculiar pangolin continues to be highly threatened in Southeast Asia. For many foreigners, “Southeast Asia” typically evokes visions of steamy rainforests, a rich and diverse cultural history, and people renowned for their charm and hospitality — rather than an import-export emporium for trade in wild plants and animals. The region’s rich biodiversity, ranging from charismatic megafauna such as tigers and elephants, to rare orchids and far-ranging marine turtles, is ironically the very reason why these species are well known far beyond their natural habitats in the international markets of East Asia, Europe, and North America. Indeed, Southeast Asia has supplied a significant portion of the global trade in wildlife for centuries. A complex chain of supply, partnered with diversifying consumer demand, makes effective conservation and management of wild species in the region extremely challenging. Consistent demand for some species — such as those favoured in the exotic pet industry (e.g. reptiles and birds), for traditional medicine practices (e.g. pangolin scales and freshwater turtle shells), as ornamental decorations (e.g. horns, antlers, and skins), in private zoo collections (e.g. primates), and as ‘tonic food’ items (e.g. pangolins, freshwater turtles, and snakes) — is now so high that the survival of many is in peril. One prime example of the Asian wildlife trade’s scope and complexity is the trade in pangolins —scaly skinned mammals that are sometimes mistaken for a reptile. Two out of three Asian species of pangolin are found in Southeast Asia — the Malayan pangolin (Manis javanica) and the Chinese pangolin (Manis pentadactyla). Although these species are some of the most observably traded animals in the region, they are often overshadowed by “poster” species such as elephants or tigers. Driven by a high demand for nearly all body parts, hunting and trade occur throughout the pangolins’ range, which in Southeast Asia extends from Myanmar through to Indonesia, and on the island of Palawan in the Philippines. While pangolin meat is considered a delicacy by many communities in Asia, pangolin skin produces distinctively patterned leather for fashioning shoes, handbags, and other accessories that appeal to consumers with a flair for the exotic. In Traditional Chinese Medicine, as well as other indigenous medical pharmacoepias in Southeast Asia, pangolin scales are believed to have almost magical healing powers, and are said to cure a broad spectrum of ailments including allergies, skin conditions, and sexually transmitted diseases. In some cultures, herbs are mixed with its scales and blood to produce a concoction that is used as both an elixir and an aphrodisiac. Furthermore, the scales are also applied as cures for malfunctioning lymph nodes, to increase milk production in breast-feeding women, and to serve as painkillers. The international community attempts to regulate, control, and monitor the trade in pangolins — and other species — through a “wildlife trade” convention known as CITES, the Convention on International Trade in Endangered Species of Wild Fauna and Flora. CITES global coverage includes almost 170 countries, including all 10 members of the Association of Southeast Asian Nations (ASEAN). Under the Convention, wild animal and plant species are grouped into one of three categories. Appendix I lists over 500 animal species and 300 plant species. Commercial trade in these species is prohibited, except for scientific purposes. Appendix II covers over 4,100 animal species and 28,000 plant species. Commercial trade is permitted but on a strictly controlled basis using CITES permits to validate export, import, and re-export. Appendix III contains over 290 species protected by national legislation, which may prohibit or restrict trade. Countries listing species in Appendix III are usually requesting assistance from other CITES Parties to help control illegal international trade. All Asian pangolins are listed on Appendix II of CITES, which ordinarily would mean that they could be traded to limits that would not affect the survival of wild populations. However, high volumes of largely unregulated trade, including illegal shipments, in the 1990s brought about an additional measure of protection: all CITES Parties decided to adopt a ‘zero quota’ for Asian pangolins, which effectively bans all international trade. Thus all trade in Asian pangolins since 2000 has been illegal. However, illegal and unsustainable trade in these and other species continues. Driven by domestic demand in many Southeast Asian countries, and from southern China, pangolins are now sourced from Peninsular Malaysia, Sumatra, and Borneo. Previously, the forests of Vietnam and Lao PDR had met much of the demand from southern China, before high levels of exploitation pushed the chain of supply further southeast. A highly lucrative business, the pangolin trade mainly profits intermediaries (or “middlemen”), rather than hunters and collectors, as the animals are transported to destination markets through continental Southeast Asia. These movements and trade patterns are evidenced by regular seizures of shipments of live and dead pangolins, their parts, and derivatives within countries such as Malaysia, Thailand, Lao PDR, and Vietnam, and at international border crossings. Here, trucks and private vehicles searched for illicit goods sometime reveal bags and boxes containing wildlife that was harvested, transported, or sold illegally. Inspections conducted by customs officials and by cargo handlers at airports in the region have turned up animals and plants hidden inside of cargo as well as passenger luggage. And, airports such as Bangkok, Singapore, and Kuala Lumpur have proven to be regional air transport hubs for more than tourists. As Reuters news agency reported in August 2002, Thailand’s increased levels of wildlife law enforcement placed it on the map as a transit country for smugglers bringing in pangolins from Cambodia, Malaysia, and Indonesia, and sending them on to China via Lao PDR and Vietnam. Some seizures have resulted in arrests and prosecutions, although many illegal shipments manage to be smuggled across borders undetected. • In November 2001, a lorry driver was arrested in Malaysia for transporting 92 pangolins to Thailand. A similar arrest and seizure took place in May that year, involving 202 pangolins in the Malaysian state of Johor. In June last year, Malaysian wildlife authorities seized 238 pangolins. • In July 2002, 558 pangolins packed in crates and hidden underneath coconut leaves were seized in the Pak Chong district of Thailand’s Nakhon Ratchasima province. A few weeks before that, 712 pangolins had been seized in the same district. That shipment was believed to have come from Malaysia, and headed towards China, Hong Kong or Taiwan. • In September 2002, an acting mayor and a junior policeman in Nonthaburi, Thailand, were among eight people arrested for smuggling 410 pangolins, hidden under a pile of coconuts. In the same month, police in Nong Khai seized 124 pangolins from a truck headed for China via Lao PDR; the driver of the truck escaped. In January of the same year, about 400 pangolins believed to have come from Malaysia were seized in Chumphon. • Various newspaper reports have quoted Thai police and customs officials as stating that more than 5,500 pangolins were smuggled during the first six months of 2002, and that the total figure including unreported cases is believed to be much higher. • In April 2002, customs officials seized approximately 1,200 Vietnam-bound frozen pangolins in Malaysia. In October of the same year, Hong Kong authorities seized 2,700kg of pangolin scales. The US$173,000-valued cargo originated from Indonesia and was en route to China. • In October 2003, 34 pangolins were seized in Singapore. The shipment originated in Jakarta. Just a month later, Thai customs seized 509 pangolins from Malaysia that were destined for China. Within that same month, they also seized 288 specimens from Malaysia that were headed for China via Lao PDR. Shepherd, TRAFFIC’s regional programme officer in Southeast Asia, commended the governments throughout the region for taking the illegal wildlife trade seriously and pointed to the number of significant seizures of species such as pangolins. "However, as the trade continues to grow, so should the efforts of the law enforcement agencies,” he said, adding that there was a likelihood that numbers of confiscated pangolins only represent a fraction of the actual numbers circulating in trade. But with so little known about this elusive creature, it is difficult to say just what the impact of trade is on wild populations. More research is needed in order to see the pangolin afforded due protection in the wild. Nonetheless, the trade in pangolins illustrates that illegal and unsustainable trade is a regional problem in Southeast Asia. Considering that trade routes and networks are both fluid and complex within the region, and connected with other regions of wildlife-trade supply and demand, cooperation at the regional level is essential. This is true not only for Southeast Asia, as a producer and consumer region, but for other major consumer regions of the world such as East Asia, Europe, and North America. The CITES CoP13 conference will provide an excellent platform for Southeast Asian nations to demonstrate to the global community that they are prepared to address illegal and unsustainable wildlife trade issues as a coherent whole, and to interface with other regions concurrently. Non-governmental organizations, such as TRAFFIC, the wildlife trade monitoring network, and WWF, also are working together towards the same ends. The ASEAN Wildlife Trade Initiative, a joint project between WWF and TRAFFIC, aims to capitalize on the first-ever CITES CoP held in Southeast Asia to increase cooperation on wildlife trade issues that affect the region. TRAFFIC, the wildlife trade monitoring network, works to ensure that trade in wild plants and animals is not a threat to the conservation of nature. TRAFFIC is a joint programme of WWF and IUCN – the World Conservation Union and works in close co-operation with the CITES Secretariat. The joint TRAFFIC/WWF ASEAN Initiative aims to increase regional cooperation in addressing wildlife trade issues of importance to the 10 Member Nations of the Association of Southeast Asian Nations (ASEAN), in advance of CITES CoP13 in October. 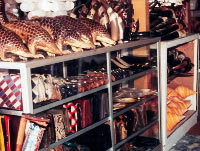 A souvenir shop in Indonesia selling pangolins (top left). The African long-tailed pangolin (Manis tetradactyla) is also hunted.